LOOKING FOR FUN AND LOVE: 1 year old / 29 lbs. Mostly Mutts adoption center is open Mon-Sat. 11-4pm. Some of us are in foster homes so please call 770-272-6888 1st to find out if I’m available to meet during the week. Hi, I’m Taffy – a super sweet and playful girl who is ready to share lots of adventures with my people! I have lots of fun with the volunteers when they take me out in the play yards at MM’s, and a game of fetch is one of my favorite past times. I may make a good jogging partner too, if you are looking for one! Check out my photos to see how photogenic I am, with my unique tail markings that contrast with the rest of my coat – so pretty, if I do say so myself – LOL. 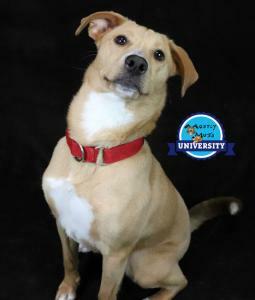 I am a new student in the Mostly Mutts University training program where I will be learning lots of great commands and doggy manners. Check back soon to see how I’m doing! My potty habits are a work in progress, as I am having some accidents on the shelter schedule. Please continue being consistent with me, so I can master my potty skills. I love playing with the other dogs I’ve met at MM’s but can be very leash reactive when I see other dogs. I am working on this with my trainer, so let’s meet if you have a very playful dog and see if we’ll be great pals too! I met a nice 10-year-old boy and his younger sister at the MM facility, and I did well with them with some jumping and mouthing, which is normal for a young pup like me. So, a home with kids around 10 (or maybe a little younger) sounds like great fun! Just remember the kids should NOT walk me due to my leash issue with other dogs, and let’s meet! And I may not do well in an apartment/condo type environment due to the close walking quarters. Energy level: 6-8. I'm current on vaccinations, spayed, micro-chipped and my adoption fee is $299.00 which also includes an engraved name tag, Martingale collar and leash.